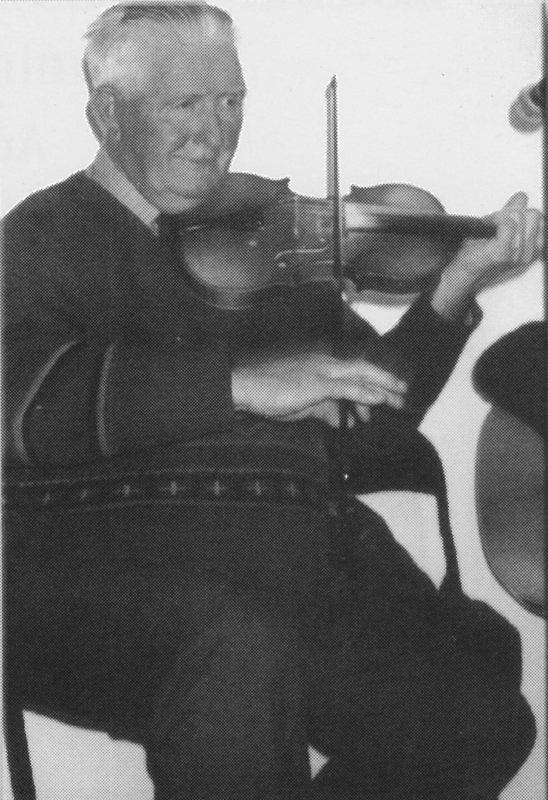 Mike Duggan (1921-2012) (also called Mikey or Mick) lived in Knockrour East, Scartaglin and was one of Pádraig O’Keeffe’s fiddle pupils, encouraged by his parents, both of whom played the concertina. He also learned from a neighbor, Eileen Spillane, who played both fiddle and concertina and who frequently hosted house parties and dances. He soon became a sought-after musician for local events and played in every pub and open house in Scart. He was a member of the Desmond Ceili Band with Denis Murphy, Johnny O’Leary, Jimmy Doyle, and Michael O’Callaghan. When Denis Murphy died in 1974, Duggan took his place playing with Johnny O’Leary for the set dancing at Dan Connell’s pub, and for local step dance competitions, and the duo continued for the next 20 years. It seems he felt his true calling was to play for dancers, be it in competition or house dance. Matt Cranitch credits Duggan with getting him started on his doctoral work on Pádraig O’Keeffe when he gave Matt a collection of O’Keeffe manuscripts and taught him how to read them. Click here to read about Mike Duggan in his own words. Timmy “the Brit” McCarthy (1945-2018) was born and grew up in London but his Irish parents maintained strong ties to their native Cork. Though he was enrolled in step dancing lessons as a youngster, he wasn’t especially inspired by the tradition. “My grandfather Timmy Roche, who I’m named after, was a champion All-Ireland step dancer, in 1922 I think, with a dance called The Blackbird,” recalled Timmy. “My mother insisted that I do step dancing, and to be honest I hated it because you used to have to wear [a kilt which] I thought was a dress.” After his parents’ death at a young age, he was raised in Catholic orphanages which he remembered with some fondness as an adult. Denis “The Hat” McMahon (1941-2018) was a respected fiddle and accordion player, teacher, and an authority on Sliabh Luachra music. Originally from Churchtown, Castleisland, he settled in Ballyhar, between Killarney and Farranfore. As a youngster he learned fiddle from Jerry McCarthy, and continued with lessons on the accordion from Pádraig O’Keeffe. At some point his friends Nicky McAuliffe and Jack Regan convinced him to pick up the fiddle again. In the late 60s he spent two winters working and living in London where he often played with his fellow expats Con Curtin and Julia Clifford. Back in Kerry he was a member of the famed Brosna Ceili Band and the Desmond Ceili Band and had a fruitful musical partnership with Connie O’Connell. 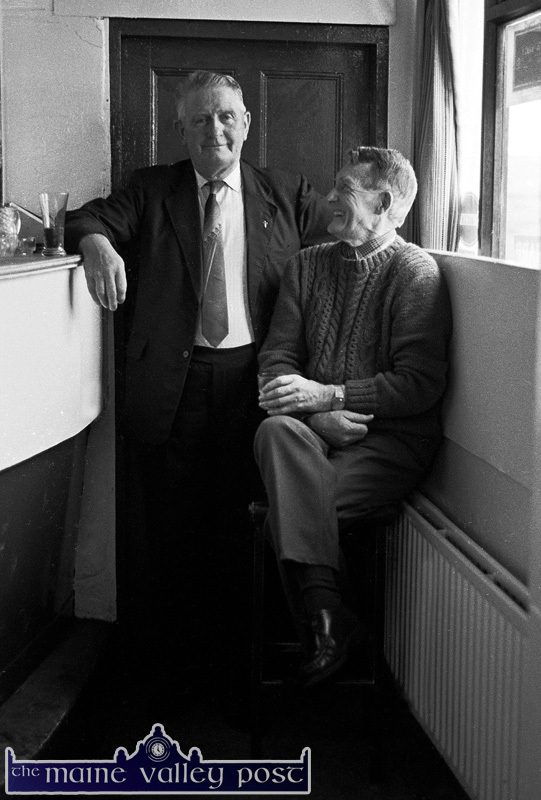 When Mike Kenny broached the idea of what was to become the Patrick O’Keeffe Traditional Music Festival, Denis was an early and enthusiastic supporter. He was quite often featured on radio and television, being a great exponent and historian of the local music, and had innumerable stories about his old teacher Pádraig O’Keeffe and others of his generation. At the 2010 Castleisland Festival, Peter Browne presented Denis with an award for his dedication to the music of Sliabh Luachra. Billy Clifford (born 1943) is the son of John and Julia Clifford and one of the few Sliabh Luachra musicians whose primary instrument is the flute. He was born in London, surrounded by a large community of Irish musicians, and hearing the music at home as well as in the dance halls at which his parents performed, it was only natural he would pick it up himself. He frequently visited Kerry on holidays with his mother as a young boy, and at the age of nine he was sent to his grandmother, Mainie Murphy in Lisheen, for an extended stay. It was at this time that he started to learn the tin whistle, and his grandmother gave him his first tune. He was also mentored by the Murphy’s neighbor Art O’Keeffe who played the whistle himself. In fact another local whistle player, who went by the colorful name of Dan Dave Dan Cronin, befriended him as well — it must have seemed to the impressionable boy that the whistle was the predominant instrument of the area! Near the end of Billy’s stay in Lisheen, his uncle Denis Murphy returned from America for a time, and furthered Billy’s musical education. Not long after, the Cliffords sent for Billy to join them at their new home in Newcastlewest, Co. Limerick. Perhaps upon realizing Billy’s advanced musical ability, John Clifford was inspired to form the Star of Munster Ceili Band in 1955. The core of the group consisted of John, Julia, and Billy, together with Liam, Pats, and Biddy of the musical Moloney family from nearby Templeglantine. The band was soon in demand for dances all over, as far afield as Roscommon and even Dublin. Denis Murphy would sometimes join them for the more prestigious gigs. They even performed on Radio Éireann on a number of occasions, though to his chagrin Billy was disinvited by the producers as they felt the whistle was not a “real” instrument! Despite the relative success of the band, times were hard, and in 1959 the Cliffords moved back to London to find work. Once more they became fixtures of the vibrant Irish music scene there, and it was around this time that Billy “graduated” from the whistle to the flute, learning from Sligoman Johnny Gorman, among others. His musical development continued with the opportunity to play with the likes of Bobby Casey, Kevin Burke, Raymond Roland, Roger Sherlock, Joe Ryan, and countless others. In 1969 Billy struck out for himself and moved back to Ireland for good, eventually settling back in Tipperary where he married and began raising a family. He soon became well-known locally as a performer and music teacher. Having lived abroad and traveled so much, Billy’s style and repertoire reflect more influences than just the Sliabh Luachra tradition. Nevertheless, he’s a proud keeper of the flame and a living connection to the previous generation, and as such is rightly regarded as a major figure of Sliabh Luachra music. Maida Sugrue (born Mary McQuinn in ~1933) was raised in the townland of Fiddane, Ballyegan, Nohaval Parish, near Gortatlea, Ballymacelligott, Kerry, on the “Low Road” between Castleisland and Tralee. 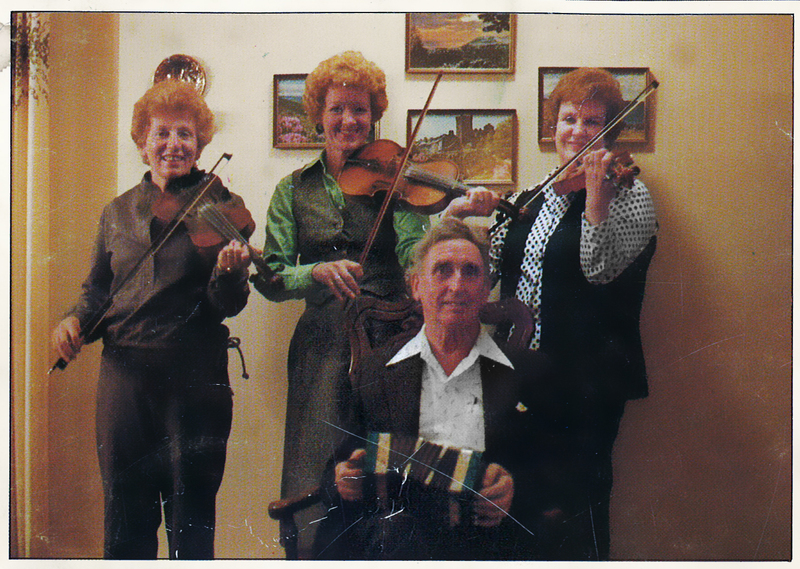 The McQuinns were a musical family: her father played the concertina and accordion, and her uncle John McQuinn was a well-considered flute, piccolo, and concertina player. Two neighbors, brothers Jim and Matty Sullivan of nearby Maglass, would sometimes visit their home in the evenings to play tunes. Jim saw Maida’s interest in the music and let her try a tune on his fiddle, and upon seeing that her desire to play was in earnest, gave her the loan of his fiddle on which to learn. She soon showed great promise, and when she was about twelve years old the renowned Pádraig O’Keeffe was enlisted to take her on as his pupil. She recalls Pádraig’s sporadic visits with fondness. Whenever he happened to be travelling through the area he would stop in to the McQuinn home. She remembers him writing out tunes in his own tablature, but he encouraged her to learn standard notation as well. She recalls that he was easy-going and funny and a great teacher. Often he would come late at night when the children were already in bed, and while her mother made him a bite to eat he would play the fiddle. The family all loved his visits and could listen to him playing forever. Lessons with Pádraig continued for about three years. In her teens, her musicianship was already highly regarded and she took part in many local music and singing competitions. She won the very first “Crock of Gold” competition put on by the Catholic Young Men’s Society (CYMS) in Tralee, and she was briefly a featured singer for the original lineup of the Brosna Ceili Band. However, subject to the economics of rural Ireland at that time, she emigrated Chicago in December, 1952. She was “sponsored out” by a cousin who happened to be a sister-in-law of Cuz Teahan. Neither were playing much music at that time, but upon meeting, they bonded over their shared tradition and both having been students of Pádraig. Cuz was delighted to hear stories of and new tunes from his old teacher. Inspired by this new connection, they struck up a musical partnership. Maida is an excellent musician and step dancer. She can sing anything in any style and she knows the Gaelic. You can really hear O’Keeffe’s style in Maida Sugrue’s playing. You might have four or five fiddles and most of them are carbon copies of each other, but when their bows are going down, hers is going up. O’Keeffe started most of his music with an up, and the way he taught was you had to keep your right hand very close to your side. You had to keep your right elbow almost on your hip, and bow with your wrist pressed firm. You press the strings firmly at right-angles with your left hand so there wouldn’t be any vibrations, and keep your thumb away from the finger-board. You hold the fiddle with your chin – not the wrist. If you were persistent in bowing widely, he’d tie a cord around you to hold your arm in close. Maida also played and sang with the live band that performed on Jack Hegarty’s Irish Hour radio program each week. For a while, after marrying Denny Sugrue in 1957, she became less active in Irish music circles, but when her children were grown she started to perform publicly again. She and Cuz formed a group with two other fiddlers, Úna McGlew and Mary McDonagh, that played in the Chicago area for some time. 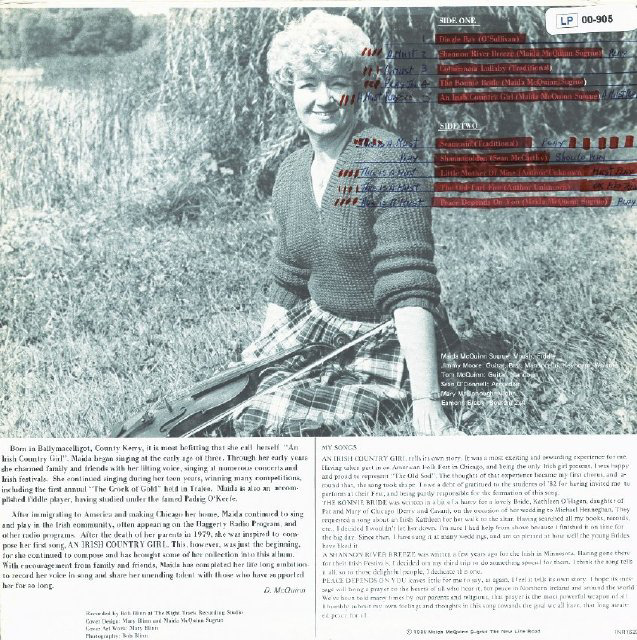 In 1985 she recorded Maida: An Irish Country Girl, an LP of songs, a number of which are her own compositions. Sadly, it was a limited run and nigh impossible to find now. 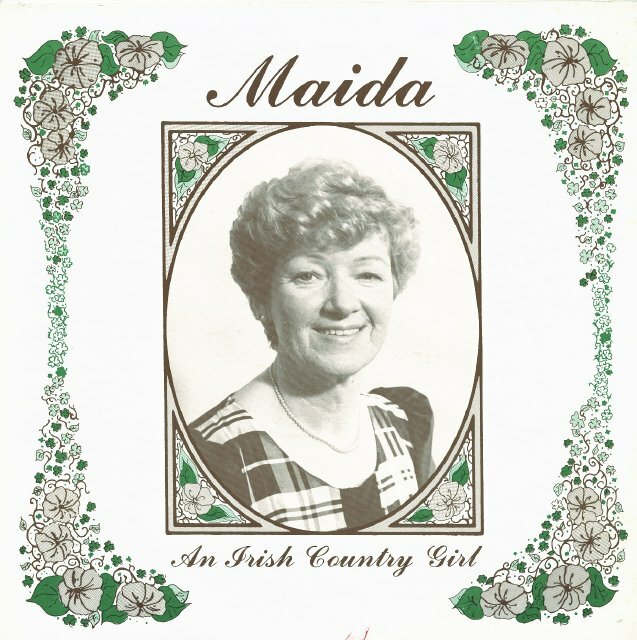 Though now retired from performing, Maida is currently still involved in the Chicago Irish music community, appearing at local events on occasion. She recently attended the Patrick O’Keeffe Festival in Castleisland, to great acclaim. She spoke and played at the Fiddle Meitheal where Paddy Jones, a fellow pupil of Pádraig’s, was delighted to meet her. Two tracks from the album Traditional Irish Music In America: Chicago. She plays The Queen’s Polka (aka The Top of Maol) and sings Táimse im’ Chodladh (I Am Asleep). Maurice O’Keeffe (September 5, 1919 – March 22, 2017) was born and lived all his life in Glounreigh (aka Glenreagh) between Ballydesmond and Kiskeam in County Cork. His mother, Mary O’Keeffe (née O’Connell but known as Molly Morrissey), was an accomplished concertina and melodeon player from a noted musical family from nearby Glencollins, and she made sure to get young Maurice and his siblings started early on the music. When Maurice was 10 years old his mother purchased a fiddle for him from a shop in Ballydesmond and arranged for lessons with John Linehan. Linehan (also sometimes spelled Lenihan) was a renowned teacher and performer from Glounreigh who had been a student of Corney Drew. By the time Maurice started lessons with him Linehan was quite aged, and indeed it seems Maurice was his last pupil. Nevertheless, the lessons were productive and imbued Maurice with a style and repertoire that would serve him well throughout his long life. When Linehan passed away, Maurice continued lessons with his mother, and no doubt absorbed considerable music from the maternal family (in much the same way that Pádraig O’Keeffe got a part of his own music from the Callaghans of Doon.) Frequent house parties, at the O’Keeffe home and those of neighbors, guaranteed plenty of opportunity for Maurice to hone his craft. Unlike some of his peers, Maurice never produced a commercial recording, though he can be heard on one track from Johnny O’Leary’s Music For the Set. His talent as a musician was undeniable, but his true legacy is that of a tirelessly enthusiastic champion of the local musical tradition. He was known to always have an encouraging word for anyone interested in pursuing the tradition, and he would often record cassette tapes in his kitchen for friends and acquaintances, playing from his repertoire of rare and interesting tunes from his old fiddle master, along with various tidbits about the music and its history. He had a vast store of polkas and slides, as well as jigs and hornpipes, with reels following in a distant last place, as they did for many musicians of his region and generation. He generously shared these with any and all, and there must be scores of these tapes scattered all over the globe at this point! The Maurice O’Keeffe Easter Weekend Festival has been held annually in Kiskeam since 2002, celebrating his legacy and nurturing the local tradition which he loved and championed. Until his death in 2017, he was not only the guest of honor but an active participant, playing away in the sessions until the wee hours. In 2007 he was presented with the Patrick O’Keeffe Traditional Music Award in recognition of his contribution to the tradition. Jerry Finbarr McCarthy was born 25th September 1926.He was the youngest of 6 children, 3 boys and 3 girls. His father Jeremiah was a farmer and his mother, Catherine Keane, was a homemaker who was from Currow. (Incidentally, Catherine Keane was grand aunt of the great rugby player Moss Keane. Jerry and all the family were very proud of Moss and his rugby achievements). 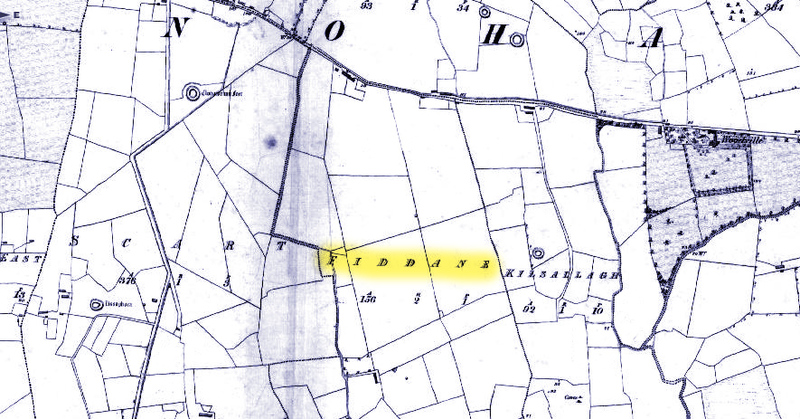 Jerry grew up in a townland called Gortgloss (An Gort Glas, also anglicised Gortglass, meaning the green fields). Jerry’s home place is situated on the top of a hill with breathtaking views of the whole county of Kerry. One can see as far as Castlemaine on a clear day. It is situated 9 kms from Castleisland and 5km from Scartaglin. The farm where Jerry grew in was originally one farm of 100 acres. His grandfather divided the farm between two of his sons. The original home of the McCarthys can be dated back to 1840. This house is now occupied by Sonny McCarthy, his first cousin. Jerry’s father built a dwelling house on the divided farm. Jerry had a very simple upbringing. He really enjoyed the land and all things associated with it, milking cows, saving hay, going to the bog. His faith was very important to him. Family rosary was recited nightly. He had a great love of greyhounds and nature. He went to school every day through the fields to Scartaglin. His teachers included Mrs. Griffin and Ned Murphy. He often brought the fiddle to school to play. Jerry showed a keen interest in music from a very early age. His father and aunts played concertina. They would often play music in Gortgloss. His brothers or sisters did not play. From a very early age Jerry use to pretend to play the fiddle with two sticks. On seeing this, his mother decided to send him to fiddle lessons. One of his first music teachers was Sr. Loyola, a presentation nun who was a secondary school teacher in Castleisland. Traditional music was very important in the area at the time. Musicians would ramble from house to house to provide entertainment. 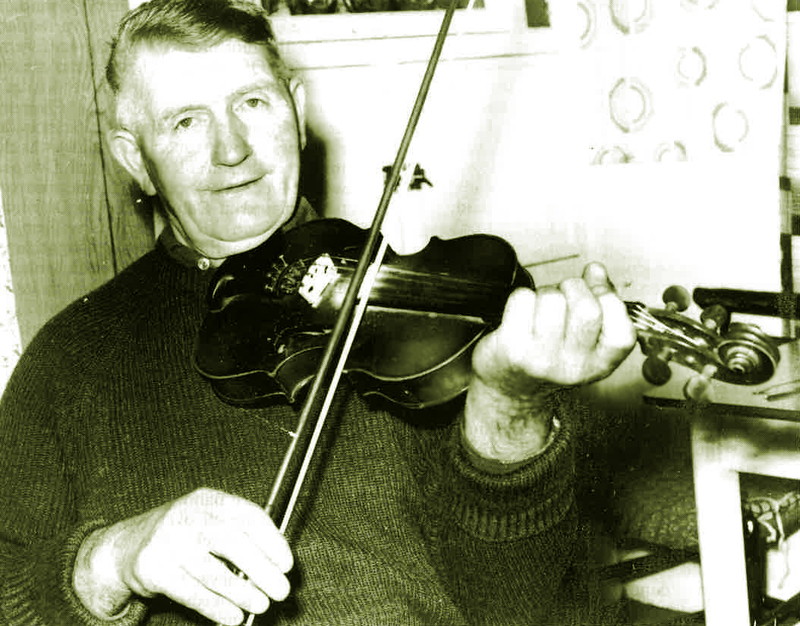 Pádraig O’Keeffe, the well-known fiddle master taught music to many of Jerry’s neighbours. Jerry had developed a huge respect for Pádraig O’Keefe and he passed on his love of music to Jerry. Pádraig taught in many of the local houses including the O’Connors and O’ Connells. He would come up to the house once every 3 weeks and writ e out a tune. Jerry began to make a name for himself as a young adult, winning local feiseanna and fleadhs. In 1949 he won a gold medal at the Oireachtas. This was a huge honour for him and his county. He was extremely proud of this achievement. (Unfortunately these medals and other medals and trophies he had won were stolen in a robbery at his apartment in New York in the 1970’s.) He played with the O’Rahilly ceili band for a short time. Also, he began to play on a regular basis for Radio Éireann . These programmes included Den Joes ‘Take the floor’, The Seamus Ennis programme and ‘Beginners Please’. Many of these were live broadcasts and many in the area can remember the excitement that a local lad was playing on the radio and gathering around the radio to listen to him. The late Ciaran MacMathuna also made recordings of him in Kerry and later in New York. 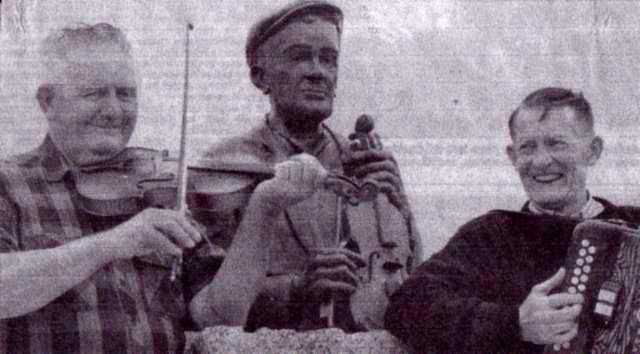 Ciaran recalled in a 1995 programme of ‘Mo Ceol Thu’, first recording Jerry at a fleadh in Kenmare in 1955. Since Jerry could not drive Ciaran would collect him and they would travel to local sessions. Ciaran recalled, on that same programme, travelling to a session in Limerick one dark winters night. Jerry was playing the fiddle in the car when a cow appeared and Ciaran hit the cow. The cow was alright, the car was only slightly damaged. Jerry forgot the fiddle was on the seat and sat on it. That was the end of the fiddle (which was borrowed.) On another occasion Jerry played for Queen Salote of Tonga when she visited Killarney. She invited him to Tonga. He never made it. A journey a bit too far for a Kerryman. When Jerry left school he worked as an insurance salesman. He worked for ‘Direct Life’ He would travel on his bike collecting money from neighbours and friends. He travelled to Castleisland, Cordal, Knocknagoshel and Ballydesmond. He was very popular in the area because of his music. A quiet man with a great sense of humour and always great for a yarn. He wasn’t materialistic and would give you the last penny in his pocket. Jerry’s social life revolved around music. His neighbour and very good friend Timmy Spillane played music in local houses. Timmy played the button accordion. He was a bachelor who also lived in Gortgloss. Everyone loved the music and there was music in most households at the time. Another neighbour, Maggie O’Connor, really loved it when Jerry and Timmy called to her house. She has fond memories of Jerry arriving with his fiddle under his arm. Maggie loved their music so much that she bought a reel to reel recorder especially to record their music. These recordings are of excellent quality. They were recorded in the 1950’s and early 1960’s. Maggie recalls travelling into Tralee to buy the recorder and buying the reel tapes. Jerry used to ramble into other houses in the area including O’Connors of Gortgloss and O’Connells in Cordal. Pádraig O’Keefe also taught the fiddle in these houses. Maggie recalls when Jerry and Timmy played the tune ‘The cup of tea’ it was time for her to stop listening to the music and put the kettle on! Jerry played music in Irish clubs and on Irish radio stations. He also had the honour of playing music in Carnegie hall on several occasions. Jerry met his wife Lena at a football match in 1965 in Gaelic park. They married in 1966 and had one daughter. They resided in an apartment in Valentines Ave and later in the Grand Concourse in the Bronx. This was mainly an Irish and Jewish community at the time. His daughter has memories of being brought to an Irish centre for All Ireland football finals when Jerry’s county were playing. He was a proud Kerry man and was a walking encyclopaedia on Kerry football. Jerry would return to Kerry on holidays from New York armed with his fiddle. The community in the Bronx was changing in the mid 1970’s. Many of the Irish were moving out and being replaced by a new Hispanic community. The fast pace of life did not suit Jerry’s easy going temperament and he longed to return to Ireland. His two sisters Lena and Siobhan had already returned in 1977 to look after their sister Theresa who was terminally ill, and Jerry returned in 1978. He secured employment with the Electricity Supply Board in Dublin as a security man. He cycled most days to the ESB head office in Mount Street until his retirement in 1991. The family resided in St. Brendan’s Drive, Coolock, in Dublin. Interestingly, many of his neighbours were from Kerry. One of which was the great seanachai, Eamonn Kelly. When he returned to Ireland his social life revolved around his music. He became great friends with the Chief Executive of the ESB, Paddy Moriarty (brother of the great radio commentator Micheal). Paddy would ask Jerry to play at ESB functions. He got involved every year with the ESB Tops of the Towns. He became a member of the Cluain Tarbh branch of Comhaltas. They held weekly sessions in the North Star Hotel on Amiens Street and later in the Maples hotel in Glasnevin. He also played every Tuesday night with the Sean Tracey branch of Comhaltas. As he did not drive he always depended on lifts. His friend Jimmy Markey would collect him every Tuesday night and the late great step dancer Donncha O’Muineachain would leave him home. He became friends with the piper Leon Rowsome (son of the renowned Leo Rowsome) who lived in nearby Artane and they met up for many a session. Leon died exactly a year before Jerry. Eamonn Kelly always presented Jerry with tickets to his opening nights in the Abbey Theatre. On a few occasions Jerry recorded music for Eamonn’s one-man shows. There was always a great meeting of Kerry people after Eamonn’s shows in the local pub in Abbey Street. Jerry always loved to meet up after such shows with another great Kerry friend, the late Con Houlihan. Jerry was always a great man for putting pen to paper and often wrote to Con, who would publish extracts of these letters in his Evening Press column. They would be about life at home in Kerry and Sliabh Luachra. When Jerry returned to Ireland he took every opportunity to visit his beloved Kerry. He stayed with his sisters on these visits. He would write a letter beforehand to his friend Denis O’Connor who plays banjo. 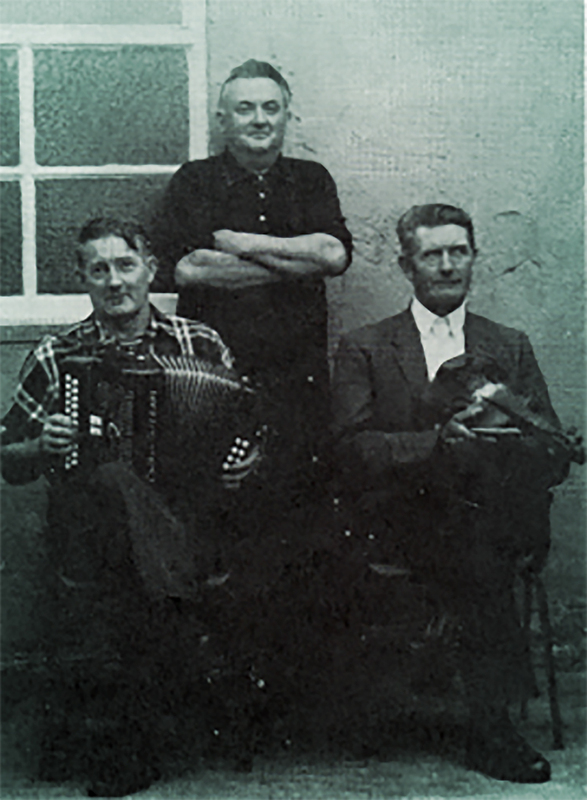 Jerry often played with Denis’s father Maurice, another fiddle player who was a pupil of Pádraig O’Keeffe. Denis would receive the letter a few days before hand. In it would be instructions when, where, and what time he wanted to be collected at. Denis would arrive at the appointed time and off they went to all parts of the county playing music. Denis has fond memories of this. Jerry voiced concerns to Denis that he had forgotten tunes he played before he went to America. Denis agreed that this was the case. Jerry never heard Maggie O’Connor’s recordings of him playing, but they verify that he played tunes in the 1950’s that he never played in the 1980’s and 1990’s. One of Jerry’s memorable musical engagements was being asked to play music in the film ‘How many miles to Babylon’ starring a very young Daniel Day-Lewis. (1981) He enjoyed being collected every day and driven out to Ardmore Studios in Wicklow. Daniel Day-Lewis went on to win an Oscar for his role in ‘My left foot’. Jerry maintained that only for Daniel meeting the great Kerryman and hearing his music he wouldn’t be the great Oscar-winning actor that he is today. Jerry really enjoyed receiving his royalty cheques from that film for years afterwards as it was sold worldwide. Jerry retired from the ESB in 1991. He had more time for his love of music, sport, politics and gardening. He could grow everything and anything and his lawn was like a golf course. Jerry loved the GAA and would listen to all the matches on Sunday on his transistor radio as they were not shown on the television at the time. He recorded many of the Kerry matches on his tape recorder. Jerry spent hours every day playing music in his bedroom with the curtains closed. Interestingly, Pádraig O’Keeffe was said to have had the same habit. Jerry continued to make recordings for RTE for programmes such as ‘Mo Cheol Thu’, ‘Ceili House’ and was part of a television programme which was recorded in Dingle. This can be seen in series 7 of ‘Come West Along the Road’. Jerry enjoyed playing all types of traditional music, but he had a very distinctive Sliabh Luachra style of playing. His air playing was very special and his party piece was ‘An Chuilfhionn’ He loved playing polkas and slides and would have very unusual variations of these tunes. He would play a tune and change key mid-way. Jerry was also a beautiful singer. He loved singing Shanagolden. He would play the tune first on the fiddle, sing the 5 or 6 verses and finish it off by playing it on the fiddle again. During the latter years of his life his little finger on his left hand became problematic. He couldn’t use this finger when playing B’. This frustrated him and he often tried to use his knuckle when playing this note. Jerry’s health began to fail soon after his retirement. A life-long smoker, he developed emphysema and later lung cancer. He spent his final few weeks of his life in his beloved Kerry. He returned to Dublin just before he died and had a very peaceful death. He passed away on Good Friday 14th April 1995.